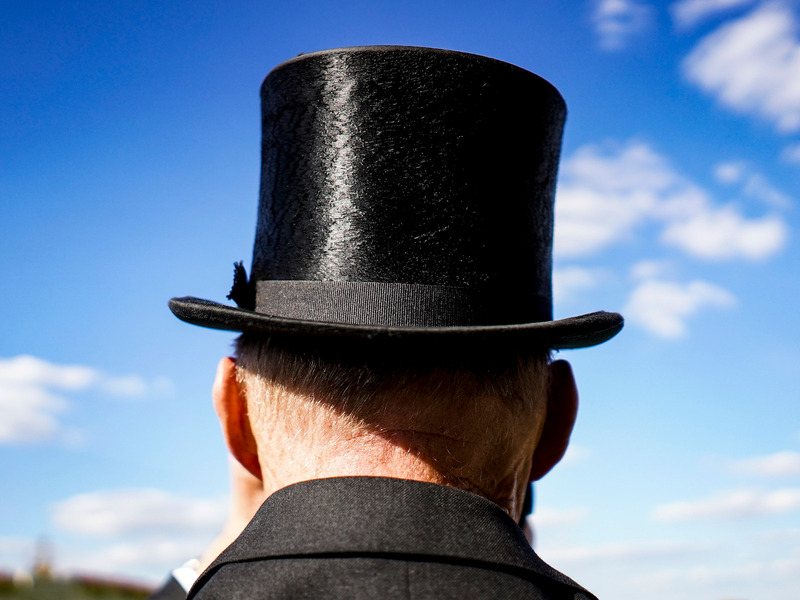 Alan Crowhurst/Getty Images for Ascot RacecourseMy current investments could grow to $US2.2 million by retirement. Sean, who goes by “The Money Wizard,” is a 28-year-old blogger and financial analyst whose current net worth is $US250,000. If he stopped saving money today, his worth could grow to $US1.6 million to $US2.2 million by retirement age, thanks to compound interest. He says his strategy isn’t complicated. Here’s how he did it. I recently turned 28, and I’ve already saved over a quarter of a million dollars. 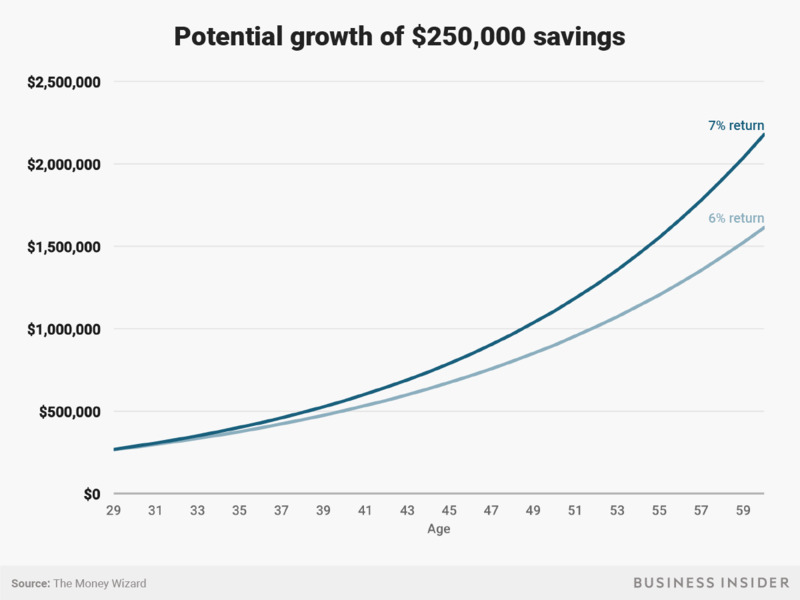 By saving $US250,000 so far in my 20s, even if I never invest another cent for the rest of my life, I should retire with $US1.6 million to $US2.2 million – adjusted for inflation! Someone once told me that old people allow us to see the future. The statement resonated with me, because it’s true. No, Granny won’t be able to tell you the screen size of the next iPhone. But we can see our future selves in the people who came before us. Through our elders, we can see what happens when we work too hard, play too much, neglect our health, or manage our money in different ways. Most old people forgot to save for retirement. Whether they were misled by a failing Social Security system or just forgot they couldn’t work forever, sooner or later they approached retirement age, and their stress levels skyrocketed as they desperately began saving too little too late, like cramming the night before a big test. They were doomed. Around the same time, I learned that my grandfather, who was one of the most frugal people I knew, was actually a millionaire. Despite earning a low, blue-collar wage and raising five children, he used basic stock market investing to retire with $US1.2 million in the bank. Path 1: I could put off investing completely. I could let the fear of losing money take over. Ironically, this ensures I lose tons of money from missed investment opportunities. Path 2: I could plan ahead. I could dedicate myself to learning how money works, and by making small changes to the things I buy now, I could take advantage of compound interest for decades. I took the second path. I started buying stocks as a teenager, and I kept investing any spare change I could find. And once I started adulting, I carefully designed my life to reduce all the wasteful spending and maximizing my happiness. Best of all? My happiness benefited from a complete lack of money-related stress, thanks to the comfort only a rapidly growing bank account can provide. Before I knew it, I was a 25-year-old with $US100,000 in the bank. I started my blog, and I began tracking my net worth every month. Which brings us to today. Despite never earning six figures (and actually spending most of my savings years at an entry-level, $US50,000-ish salary) my net worth just hit $US250,000. Roughly half of that $US250,000 I’ve stashed away in 401(k) and Roth IRA retirement accounts, and the other half is held in post-tax brokerage accounts. And for all of that $US250,000, I’ve invested in the lowest-fee, most broadly diversified Vanguard index funds I could find. What if I stopped saving today? A few weeks ago, I decided to run an experiment. I’m currently saving like a madman, but what if I stopped saving completely? Finance 101 says compound interest is one of the most powerful forces in the universe. But just how powerful is it? I fired up the financial calculator – which is oddly similar to a normal calculator, just with a couple of extra compound-interest buttons thrown in. I’d never save or invest another cent for the rest of my life. My money would return 6-7% per year, which is the stock market’s historical return after subtracting inflation. I’d let my portfolio compound until age 60 (the “normal” age of retirement, at least according to 401(k)/IRA withdrawal rules). I typed in the numbers, hit enter, and about fell out of my chair. 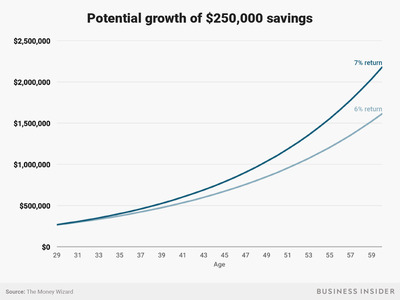 At 6% per year, the money I’ve already saved in my 20s should compound into $US1,582,525! At 7%? That would be $US2,137,194!!! Andy Kiersz/Business InsiderCompound interest is one of the most powerful forces in the universe. For decades, most people slave away at jobs they hate, hoping to save enough money to eventually retire. Many never make it. And yet, thanks to a few short years of “sacrifice” early, just five years into my full-time career, I’m basically set for life. I’ve already reached the goal that’s driving so much stress in this world, and because of that, I’ve unlocked endless opportunities. Stop saving entirely and start spending every dollar I earn on a lavish life of luxury. Keep saving for years and build the portfolio to filthy-rich levels. Walk away from a stressful career in finance and chase a lower-paying dream job. Take a sabbatical from work, travel the world, or chase the entrepreneurial dream. Or I could keep saving like a maniac for a few more years and cut that retirement age from my 60s to my 30s. The point is: I have options. And so can you. The amazing part of my story isn’t that I hit whatever milestone so early on. The amazing part is that my strategy is so easily replicated by anyone who’s dedicated. I didn’t profit off an amazing investment strategy or some lucky cryptocurrency bubble. Nor did I come into lottery winnings, sell a business, or get promoted to a high-powered career. Instead, I simply started investing as early as possible, and then designed the lowest-cost lifestyle I was comfortable with. From there, I invested as much as I could in index funds (aka the most simple investment ever) and let compound interest run its magic. As our financial calculator showed, I was shocked to see how much I was underestimating compound interest in my portfolio. Chances are, you are too. So start investing today. Build yourself a strong base to compound your way towards wealth. Before you know it, you’ll find yourself loaded with options, which is exactly what this money game is all about.